• Simple 10 Day Program. • No Harsh Stimulant Laxatives. • Supports whole body detoxification including the intestines, liver, gall bladder, circulatory & lymphatic systems. • Everything you need to cleanse in a convenient kit…including the fiber! • A gentle, non-stimulant laxative with a soothing herbal blend to promote healthy and comfortable bowel cleansing. • Milk thistle to help eliminate toxins and support liver function. 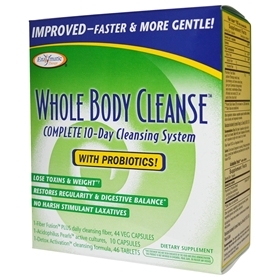 Whole Body Cleanse offers complete detoxification. Day 2-8, take 4 capsules at night with at least 8 oz of water. Day 9-10, take 4 capsules in the morning and 4 capsules at night with at least 8 oz of water. Fiber Fusion PLUS is a Vegetarian Formula. One capsule daily, with water or your favorite beverage. May be taken with or without food. Do not chew or crush. Day 1-8: Take 5 tablets with 8 oz water in the evening. Day 9-10: Take 3 tablets with 8 oz water in the evening. Reduce dosage if you experience abdominal discomfort or diarrhea. If discomfort persists, discontinue use. Detox Activation is a Vegetarian Formula. Warning: Consult a healthcare professional if a sudden change in bowel habits occurs and persists for ten days. Rectal bleeding or failure to have a bowel movement after use of a laxative may indicate a serious condition; discontinue use and consult a healthcare professional. Do not use if pregnant or nursing. Unless directed by a healthcare professional, do not use laxative products when abdominal pain, nausea, or vomiting is present, or if you have kidney disease. Do not take more than five tablets in a 24-hour period or use the maximum dosage for more than ten days. If taking prescription drugs, consult your healthcare professional prior to using Detox Activation. Caution: Taking this product without adequate fluid may cause it to swell and block your throat or esophagus and may cause choking. Do not take this product if you have difficulty in swallowing. If you experience chest pain, vomiting, or difficulty in swallowing or breathing after taking this product, seek immediate medical attention. If pregnant, nursing, or taking prescription drugs, consult your healthcare professional prior to using Fiber Fusion PLUS. If taking prescription drugs, consult your healthcare professional prior to using Acidophilus Pearls. cellulose, vegetable capsule (modified cellulose), silicon dioxide, and magnesium stearate. vegetable oil (palm and coconut), fish gelatin (Tilapia), vegetable glycerin, soy lecithin, and pectin. Acidophilus Pearls may contain a minimal amount of residual milk protein. cellulose, soy lecithin, modified cellulose gum, stearic acid, modified cellulose, silicon dioxide, magnesium stearate, vegetable glycerin, and carnauba wax.